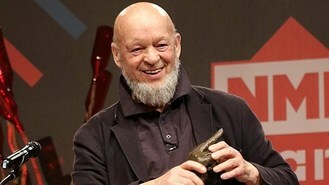 Glastonbury founder Michael Eavis has teased about this year's secret third headlining act, but denied it would be Oasis. The festival founder revealed that it will be "one of the biggest-selling bands in the world at the moment", and confirmed that it will be the group's debut at Worthy Farm, Somerset. "We are expecting to announce the full line-up at the beginning of May and everything is now in place. We are more than happy with the calibre of the acts and the headliner on Saturday will be one of the biggest-selling bands in the world at the moment," he told Bristol Post. Arcade Fire and Kasabian have already been confirmed for the Friday and Sunday slots at the festival respectively but the Saturday night headliner has not yet been revealed. Michael, whose daughter Emily helps him with booking the acts, said they had not "considered" asking Oasis to perform. Liam Gallagher sparked speculation that the band could be reforming after he tweeted the letters O A S I S and OASIS LG on April 24. But Michael said: "The Oasis thing had nothing to do with us, we hadn't even considered asking them. They've played at the festival three or four times and they're a great band. "I'm not sure that Noel is ready to go back on the road with Oasis because he has his own band at the moment. I think if it were to happen and they did come back to Glastonbury it would probably be in four or five years time - I can't see it happening before then." Meanwhile, Noel Gallagher joked that he would get his Oasis bandmates back together for £500 million - or 500 million condoms. "I was in the newsagent the other day when the story broke and the Daily Star said, 'Oasis to get back together for £500 million', which is half a billion. I'd do it for half a billion anything: Yorkshire Tea bags, condoms, Pot Noodles," he told Talksport. Tom Fletcher has revealed that supergroups need natural chemistry, like McBusted. Robbie Williams has said he won't be able to work on Take That's next album or have a permanent place with the group on tour. Having spent more than half-a-century performing to audiences around the globe, there were few stones left for Sir Paul McCartney to overturn. Billy Joel has said he once tried heroin which inspired one of his songs, but it scared him so much that he never used it again. One Direction appealed for calm as fans got hurt during the band's latest performance in Peru. Charlie Simpson - who opted to miss out on the lucrative McBusted collaboration - is to release a new solo album. Beyonce has talked about the pressure on women to look good as she unveiled her new single, Pretty Hurts.